The steering- and suspension-focused show demonstrated the kind of suspension damage which could occur on even a parked, unoccupied vehicle struck by another car. 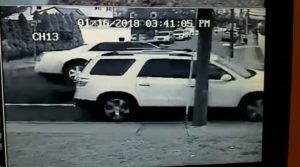 Collision Hub showed footage from a New York incident in which a parked vehicle was sideswiped by a car, sending it onto a curb and the victim’s passenger-side wheel rotating clockwise — until it stops and reverses counterclockwise..
“The transmission’s damaged in this vehicle most likely,” Montanez said. “You just put a lot of energy into that transmission,” I-CAR curriculum and product development director Josh McFarlin said, noting that the rotation of the wheel indicated the system had absorbed and released energy while in park. A month to a year down the road, that impact might lead to a seized transmission, Montanez said. 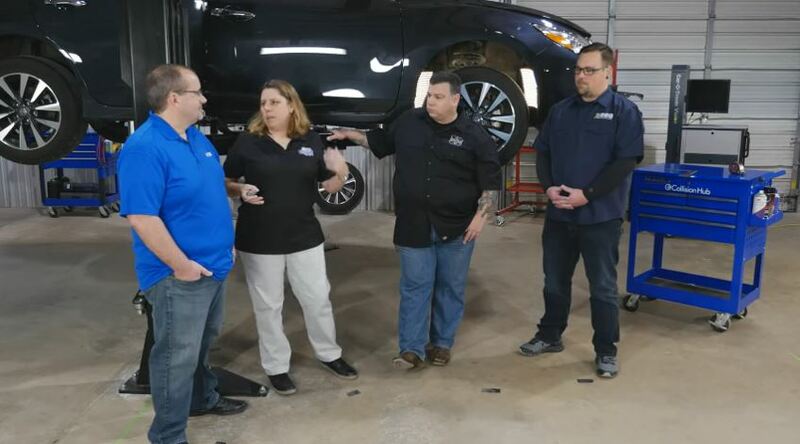 Collision Hub CEO Kristen Felder estimated that 99 percent of shops encountering a parked, unoccupied vehicle with an impact to the rear or quarter panel would assume “‘no need to worry; let’s just move on'” and omit inspecting the suspension. Every vehicle “is going to need a suspension and steering diagnostic and analysis,” Felder said. The system is the only part of the vehicle touching the road, and “that’s where the friction is” in a collision, she said. Therefore, the odds of something bending or breaking in a crash is “very, very high” she said. Such applied stress to components can lead to a critical failure, defined as “a part just fails in the middle of driving,” according to Felder. Felder and Montanez indicated that what Felder called the three traditional “triggers” dictating an inspection of the suspension — impact to wheel assembly, visual structural damage, and a vehicle sent of the road — didn’t adequately capture all scenarios in which a suspension could suffer damage. Besides the liability from unwittingly leaving a suspension compromised, shops and carriers who fail to inspect the system prior to starting work on the vehicle might miss the chance to flag a total loss up front. Montanez said some shops might see the vehicle in the video and fix what was likely to be obvious exterior damage from the sideswiping — and not realize until later that the vehicle would be a total. Montanez said that checking for collision damage should be a secondary thought if indicators of suspension or mechanical damage existed. “Maybe do those first,” he said. Steering and suspension can be “big-ticket items” — the kind of thing that should be contained in an initial estimate rather than a supplement, Felder agreed. Whether the shop chooses to charge for not-included suspension diagnostics and inspection is a business decision, but “make it part of your process,” Database Enhancement Gateway Administrator Danny Gredinberg said. “Find it early,” Gredinberg said, for such damage can be the make-or-break factor on whether to repair a vehicle or total it. Uneven or premature tire wear can be an indicator of suspension damage, but it can trip up shops as well. “I think this one we overuse,” Felder said, with shops prematurely jumping to the conclusion that an absence of tire wear means the suspension is fine. McFarlin pointed out the fallacy of that hypothesis by noting that tire wear only reflects past damage. If an undamaged suspension was damaged in a collision and brought to a shop soon after, there might not be any tire wear on the vehicle to serve as a red flag — it wasn’t on the road long enough. “It’s not going to show up immediately,” he said. Another error might involve examining the suspension solely on a rack. Felder, a former insurance adjuster supervisor, noted that one of her pet peeves was adjusters failing to get down and look under a vehicle, asking shops to instead raise the vehicle on a rack. “You’re going to have to lay down and get underneath them,” Felder said. “The story tells a lot,” Gredinberg said.